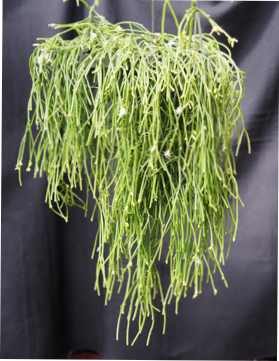 Basionym Rhipsalis baccifera (Mill.) Stearn subsp. hileiabaiana N.P.Taylor & Barthlott. Bradleya 13: 63 (1995). Holotype: Brazil, Bahia, Mun. Ilheus, 7. Aug. 1983, J. L. Hage & H.
S. Brito 2113 (CEPEC, holo; K, MBM, iso). Taylor suggested from this photo that it was R. hileiabaiana. DISTRIBUTION. Brazil (Bahia): epiphyte in per-humid Atlantic forest (Mata Higrofila Sul Baiana) and montane cloud (brejo) forest, low elevations to c.1800 m altitude. This new subspecies is restricted to the regions of Bahia receiving most rainfall (within the 1750 mm annual isohyet along the coast, the 'Hileia Baiana', and from per-humid cloud forest in the highest part of the Chapada Diamantina). In its densely branched habit, it strongly resembles and has been confused with forms of R. teres (Vellozo) Steudel sens. lat., but has flowers (to 6 x 4-5 mm) and larger, white fruits (to 7 x 5 mm) differing in no essential way from those of R. baccifera subsp. baccifera; likewise the perianth remains whitish post-anthesis, not deep yellow. Specimens bearing only apical fruits could also be confused in the herbarium with R. campos-portoana (Subg. Erythrorhipsalis), if fruit colour has not been recorded. However, plants of subsp. hileiabaiana bearing flowers and fruits in terminal position on the ultimate and penultimate stem-segments also produce them laterally on the long extension shoots, in contrast to members of the related Subg. Erythrorhipsalis.